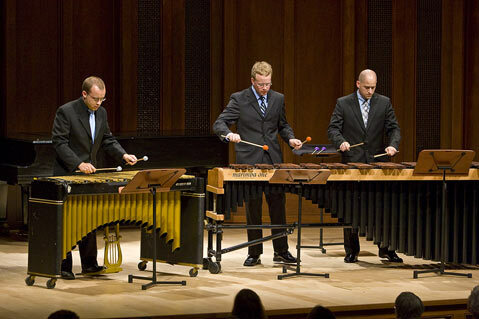 Kevin Kosnik (pictured center in a previous performance) was the soloist on Bob Becker's Girlfriends Medley, a ragtime suite arranged for xylophone, marimbas, and drum set. The Music Academy’s picnic concerts are perennial sell-outs for one obvious reason-these programs are the academy’s most direct way of letting students take the spotlight. Every piece is introduced by one of its performers, and at no time do faculty or patrons intrude on the season’s latest crop of young virtuosi. This is classical music at its most refreshing and energetic, full of the passion, excitement, and the sheer abandon of youth. Friday’s concert began with Isaac Melamed introducing and then playing cello in Astor Piazzolla’s Le Grand Tango for cello and piano. Kevin Garnica joined him, and the pair unfurled Piazzolla’s romantic sonorities with restraint and rapt attention. Next came Lyle Wong, clarinet, and Jing Li, piano, for Leonard Bernstein’s Sonata for Clarinet and Piano. Although it wasn’t necessarily the composition highlight of the program, Wong nevertheless proved a memorable soloist. The Horn Trio in E-flat Major, Op. 40 of Johannes Brahms gave Hana Chu, piano, Lindsey Bordner, violin, and Matthew Berliner, horn, the opportunity to play one of a small number of true classic repertoire pieces written for the horn, and Berliner proved himself ready for the spotlight, both with his historically minded introduction and with his fluent, well-modulated tone. It was Brahms again upon our return from intermission; this time it was his Sonata for Viola and Piano in E-flat Major, Op. 120, No. 2. Sixto Franco offered a charming introduction and a less revelatory performance of this difficult standard. The next string and piano pair brought out the evening’s musical highlight, Beethoven’s amazing and Mozart-esque Sonata for Violin and Piano in E-flat Major, Op. 12 No. 3. Thomas Rodgers is clearly a very promising violinist, and once he and pianist Min young Kang established authority over the slow tempo of the opening of the Adagio, their performance never wavered. They were followed by a lovely string quartet in G Minor by Debussy-the only one he ever wrote. After covering all this deep musical territory, the students knew to bring out the trombones and the marimbas. Saskia Apon’s Trombone Quartet was a kaleidoscopic celebration of long sliding horns, and Vanessa Fralick, Paul Jenkins, Douglas Rosenthal, and Louis Bremer made it rock. The finale, a medley of ragtime arranged for marimbas, featured a percussion section that was both virtuosic and quietly comedic, and it brought down the house. As the lone xylophonist, Kevin Kosnik stole the show.